Construction of the Sanmen nuclear power plant has reached a milestone with the installation of the pressure vessel for the first reactor. China's State Nuclear Power Technology Corporation (SNPTC) has a major role in the transfer of knowledge and technology from the plant supplier, Westinghouse, while building the world's first AP1000 units. SNPTC announced yesterday's successful lift, noting the role of the vessel as the heart of the power plant as well as its vital safety significance over a design life of 60 years. The huge component was made in South Korea by Doosan Heavy Industries using some forgings from China First Heavy Industries. It was shipped to Sanmen in July and yesterday lifted to a height of 54 metres in order to enter the reactor building through its open roof and then lowered into place with just 15 centimetres to spare on each side. The vessel head and control rod drive mechanisms are to be shipped and installed separately. Meanwhile, construction at Sanmen's second reactor is progressing. 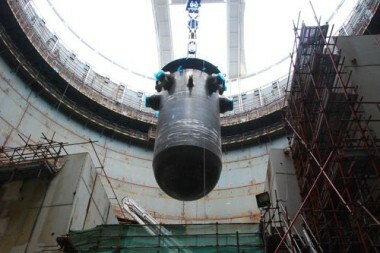 On 19 September, the third ring of the containment vessel was put in place in another heavy lifting job. The same work at unit 1 was carried out on 12 September 2010.